Ask a Student Health Educator! Afternoon Men is comprised of Amherst alum Daniel Adler ‘14 and Nicholas Fowler ‘15E, as well as Harris Tartell, William Biondi and James Cimina. 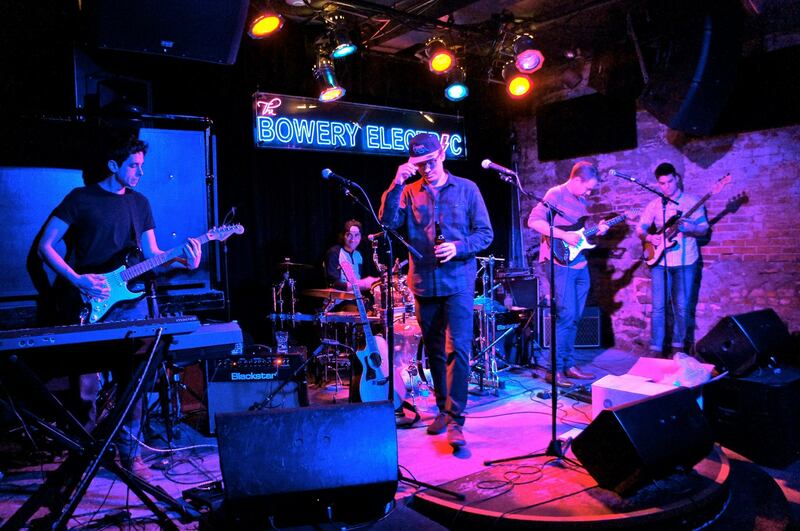 Afternoon Men are an up-and-coming rock band based in New York City, whose members include Dan Adler ’14 and Nick Fowler ’15E. I had a chance to speak with the longtime comedians and newfound bandmates about the production of lyrical gold and the journey from a suite in Pond Dormitory to the rock clubs of New York City. Q: Can you talk a little bit about the band members — where are you all from, what instruments do you play and what were your majors? NF: Harris Tartell, the keyboard player and rhythm guitarist, is from Great Neck, Long Island. He went to the Blair School of Music at Vanderbilt. He majored in composing and nearly completed a finance minor. DA: He did have that almost-finance minor. NF: William Biondi, the lead guitarist, is from Greenwich, Connecticut, and also went to Vanderbilt. I think he majored in Russian and German Fairy Tales. DA: In the course of Nick answering that, I realized I have no clue what William majored in. I also don’t know what James Cimina, our drummer, majored in. NF: James is from Fairfield, Connecticut, and went to the University of Michigan. I too have no idea what he majored in. But he’s very good at the drums, maybe he majored in percussion. DA: I know what I majored in and what Nick majored in because we were in separate rooms in Frost a lot. I majored in English and math, and Nick majored in economics and did finish the major. I’m from Brooklyn. Nick is from where William is from. Q: How did the band come into being? NF: I guess it started back on the first day of kindergarten when I met William and noticed he knew a lot about Pokémon. We’ve been friends nearly every day since then. And on one of those days, I think in seventh grade, he called me up and said, “Hey, we’re starting a rock and roll band.” That band never got off the ground but that’s when I started writing my own songs. William and I played in a couple bands in high school that were all pretty abysmal, and then, after 13 years of going to the same school together, he went off to Vanderbilt, and I went to Amherst, where I met Dan, who invited me to a “pre-game” in Appleton, which turned out to be the most humiliating attempt at throwing a social gathering I have ever witnessed. At that moment, I knew that if I ever started a rock-and-roll band, I’d have to get that kid to play bass in it. Fast forward to the end of junior year of college, when I met James through a mutual friend, and decided to spend the summer playing in a bar cover band with him and some other kids. Eventually, I graduated from Amherst and managed to convince William to move back up north from Nashville to take another stab at playing in a rock-and-roll band with James and me, and he managed to convince Harris, who was his best friend at Vanderbilt, to play keys and I managed to convince Dan to play bass. And finally the current iteration of Afternoon Men was realized in October of last year. As for the name Afternoon Men, that came from a book Professor Pritchard handed to me on the first day of a special topics course we did together. The book follows a bunch of vaguely employed guys as they sit around in bars and pubs and drinking clubs talking and drinking and failing to attract women, among other things. DA: Professor Pritchard was also my thesis advisor. Nick's summary of the book broadly applies to a few different books he pointed us to, and also a good deal of Nick's lyrics. Q: How does the songwriting process go? Are you working on anything new you’d like to talk about? DA: Nick writes the songs. Best I can tell, his process involves sitting locked in a room until a song is done. He’s dedicated. That’s probably where Amherst comes in. If you took the work ethic and structure that’s typical of an Amherst economics major and applied it to songwriting, you’d have Nick. NF: And then when a song is done I show it to the band and we learn it and play around with it and try to make it an Afternoon Men song. As for what happens in the locked room, I do a lot of sitting in a chair. I’ve also been really into the recording and production side of things since eighth grade. So I can waste an extraordinary amount of time fiddling with compressors and equalizers and guitar tones and drum sounds. The way I write songs changed a fair amount after I took Professor Robinson’s class Electroacoustic Improvisation, and he turned me onto some different software and started working with me in a whole bunch of special topics classes throughout my time at Amherst. He was unbelievably nice and helpful to me. We would also do this exercise in some of our special topics classes where he and I would just sit and listen to a song we like and ask ourselves, “Why is that good?” Or “Why do I like that?” which were both useful and a funny way to spend an hour. DA: And as far as “Afternoon Men song,” it’s important to point out that James, Harris and William are all accomplished musicians from different kinds of musical backgrounds. When Nick first brings a song to practice, there are a bunch of ideas and revisions flying around. Harris is a composer by trade, for instance and just moonlights as a rock musician. Q: I’ve seen some critic excerpts on the band’s Facebook page that offer interesting descriptions, but I am wondering how you would describe your sound. DA: Sorry, I think this is hard for Nick to answer because he’s the one writing the songs. He’s a real student of rock and pop music. There’s some Springsteen, some Sinatra, some Billy Joel, some Dylan, some Van Morrison, some Replacements ... but then there's also Hold Steady and Titus Andronicus and more modern influences. And the cool thing about his songs, or one of the cool things, is that they tend to be about rock music. So if a character in one of the songs leads a life that is significantly affected by Springsteen, that’ll be reflected in both the sound and the lyrics. The songs’ characters reappear in other songs, too. The storytelling aspect is what I first noticed when Nick started sending me demos, and I’ve found that to be the case for most people who listen to us. I think the best way to think of the arc of the songs is as a connected series of rock-musical stories in which rock itself is a plot point. Q: Are there any musical influences that may have helped in that sound creation? DA: Everything I mentioned before. It might also be a good time to add that Nick and I became friends during our first year at Amherst when we and some other people would gather in the laundry room of South every Monday evening. I don’t know if we started talking about The Strokes on one of those Mondays or when we were in the same room group for one of the next three years of college, but that did happen at some point. And then we finally saw The Strokes together a few weeks after I graduated. NF: We threw a Kanye West and Strokes party once in senior year, where we played Kanye West songs interspersed with Strokes songs. DA: Yeah, that was back in Pond 107. If I recall correctly, that dorm won’t exist next year? Rest in peace. Q: What sort of gigs have you been doing, and what has the experience of being the up and coming band in New York been like? How are you finding places to play, and how are you generating interest? NF: We managed to book a show at a Lower East Side rock club called Pianos without having any sort of reputation or following, but the talent buyer seemed to like the two songs we had released and gave us a shot on a Tuesday night, and a whole bunch of people came, and all the tickets got sold. And then after that a bunch of talent buyers at other venues around the city actually started contacting us, which was cool. DA: The idea is mainly to play at rock clubs in the city that we, and people we know, like being at. And there seems to be some sort of ladder that means once you book one show, it’s easier to book the next. So we’ve been able to do a few around Manhattan and Brooklyn over the last few months. That’s been a lot of fun. Q: How much time are you devoting to the life of the band? I assume it’s been tough balancing the process of gaining traction, and well, the rest of your life? NF: I devote a fair amount of my time to the life of the band. I do some other stuff, too. I text William. I write some non-Afternoon Men songs. I needle point. I text James. I collaborate with some other songwriters and producers. I text Harris. I dated some people, but they all started dating some other people instead. I do some private tutoring. I text Dan. DA: The good thing is that there are five of us and we communicate constantly. So even if we can only get together, say, twice in a given week, we can get a good deal of both the musical and logistical work done in separate places. We’ve got a text thread for general business, a text thread for social media, a text thread for general banter, a text thread for trading BuzzFeed articles and a text thread for dating advice. Q: Where do you see the band going, and what Afternoon Men-shaded dreams do you have for both the near and distant future? NF: There are some festivals that’ll pay a whole bunch of money to have you play rock-and-roll music for an hour or so. I’d like to figure out how to do some of those. I think we’re also going to start trying to play in some other cities. I’ve also got four different albums planned out in excruciating detail, but can’t seem to find the energy or money to record them in a way that would make it worthwhile. Right now we just record all the songs in my basement. We also have this dream of making shirts with a picture of the hats we already made on them, like a T-shirt, with a picture of the hat on that T-shirt. DA: Remember when Macaulay Culkin and Ryan Gosling had that T-shirt war? Where they kept making T-shirts with a picture of the other person wearing the T-shirt from the previous stage of the battle? That’s one way to think of the eventual progression of the T-shirt/hat deal. Q: What’s your next gig? NF: We’re playing at Pianos again this Saturday, March 12. I have it on good authority that that’s the first day of Amherst spring break, so if you’re reading this and will be in New York, I hope you’ll come by. Q: Any interest in playing at Amherst in the future? DA: I have it on less good authority, but still pretty good authority, that we’re playing some sort of show at Amherst before the semester’s out.